Comics&Cola: Our happy ending involves a Yellowcard song. Please don't laugh. Our happy ending involves a Yellowcard song. Please don't laugh. I'll do something I rarely do; I'll actually explain what this is. Because you should know, and I cannot expect you to already. Not that it's complicated. Complex, sure. But not complicated. You'll read this and feel something, and maybe your dissection of whatever you've felt will come with its own barriers, but the comic book itself is laid out so well I wouldn't expect you to stumble at any instance. And that's essential, because this story would easily bury itself in political statements, history rifts and the revolution without a compelling point of reference. It's a socially conscious, soapbox work, yet it's grounded, thankfully, by a regular human need. It moves you through things rather than dictate a mark to stand on, and that's where the energy lies. That's where you'll recognize a storyteller aware of what they're doing versus somewhere slugging away at another manifesto. And God knows we don't need another one. War of Streets and Houses belongs to the auto-bio comic book genre, but it manages to escape that by pacing itself like a dream or lucid recollection. 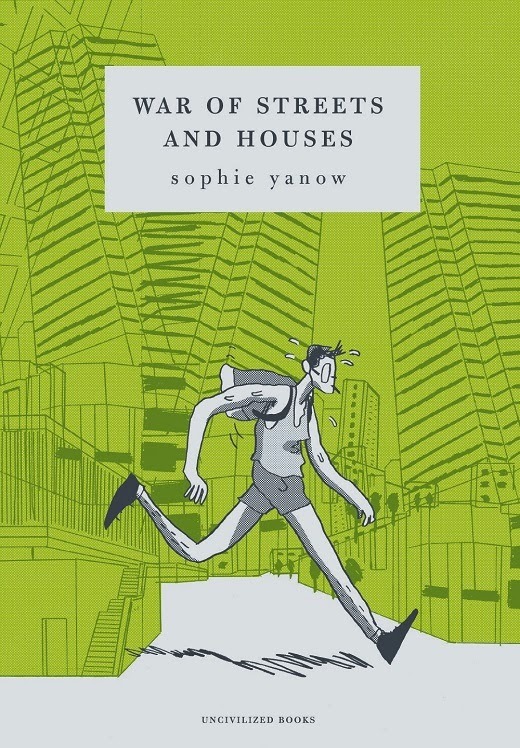 Yanow appears, by construction, as the title's key character, and we basically sift through her thoughts as she interprets a series of protests once participated in. Those events left a mark, and like anyone it's that mark - that aftermath - that requires meaning. That's your story. That and other things. 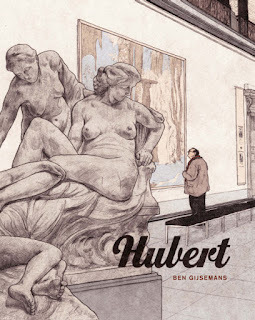 Given the title, this comic is inherently fascinated with setting, and while that youthful romance commonly attributed to cityscape is present, it's not so in a way you'd expect. Yanow questions "the city." She doesn't argue for its stature or status, and that leads to a fresh discussion of the affect left by Metropolis. This is someone raised by the city, and like anyone later on, she's questioning the parenting received and acting out, trying to tear it down. You can see that with what's on the page. Her backgrounds are sparse, blowing past the intricate environment she's inevitably in by ignoring what's behind her. And when she does acknowledge, it's more so to dissect those city grids than to admire them. A number of other elements occupy this comic, and you could sit and catalog those things as long as you'd like, but the impression is left in Yanow's construction. It's a book of tight six grids, and while I'm sure that enables this thing to move with such timing, it's the focus of those panels - nearly always following the character - which gives the reader their looking glass. It's that woman in the glasses, lugging the backpack, running through the streets who is interesting. All the philosophy is icing. It, and the events surrounding her, are what send the character into action, driving her and not the narrative. 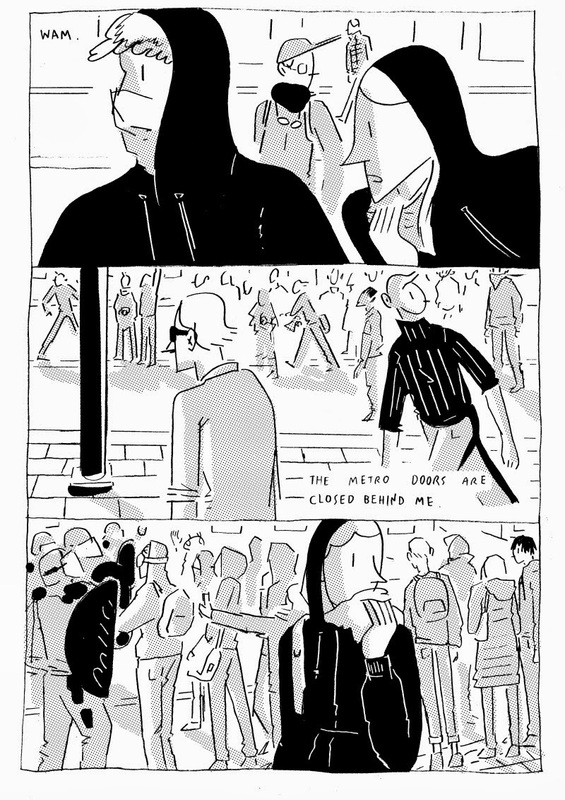 And that sets up the ending - a quiet page, leaving our protagonist and her friend some time later still uncertain. Feeling that "something broke." Not knowing if it can be fixed. There's this line ... "I know so few of the names of the streets where I grew up," and it's pretty killer. It's in my head now. Repeating.